Planters for all the spaces of your home! Even though our house is awash in a sea of hyper-tuffa’ed goodness, I still can’t help but appreciate a fine bit of potted design once in a while. This one might need to find a home in our modern house sometime soon, yup? What I find so beautiful is the use of negative space, as well as subtle texture and coloration. Bravo! 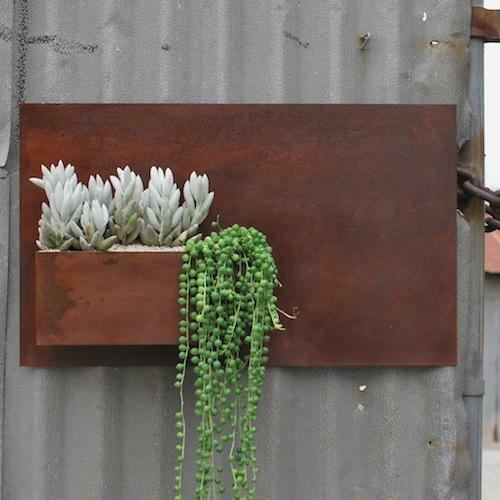 This entry was posted in Random Inspiration and tagged modern pots, modern sculpture, Potted, potted LA, steel planters, succulent planters, wall planters by Truly Unruhly Studio Jewelry. Bookmark the permalink.